Now we are just past the halfway mark I am beginning to feel as if I am in a bit of a whirl! I have so much that needs doing apart from Thing-a-Day that I am beginning to struggle finding the time to fit it all in. Since I managed to do all 28 days last year I am determined not to fail this year!! …but it is not easy!!! Whoever said that Sunday is the day of rest just hasn’t got a grip on the real world!! I seem to have been constantly on the move today and getting my ‘thing’ done has been squeezed between getting organised for dinner and visiting a friend. I would have liked to have done a bit more…but at least I managed to do something! Today, I got a little closer to finishing off that super lampwork cabouchon bead! 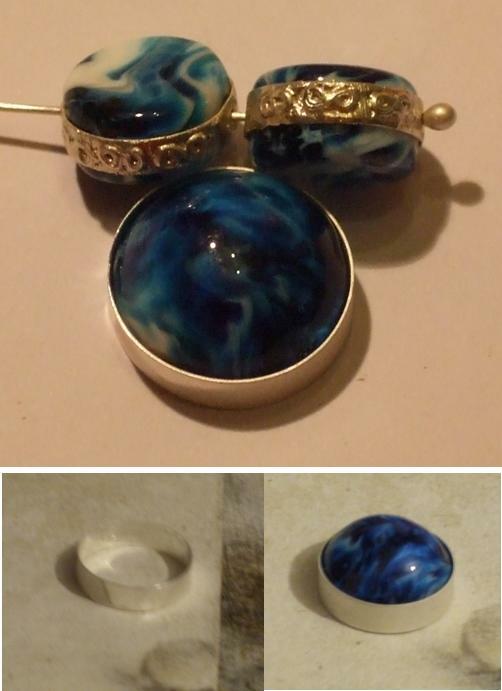 I have already decorated two drum shaped beads by making rings out of fine silver sheet which has then been embellished with PMC (precious metal clay) slip and tiny pieces of fine silver wire twisted into scroll shapes and embedded into the PMC. I have drilled little holes in the silver bands so that a piece of wire will fit through the rings and go through the hole in the bead – which holds everything in place. I can then wire these beads onto chunky chain to make quite a statement! I rather like the effect and think it makes the glass beads look like something from antiquity. So I want to do the same sort of technique with this bigger bead. Having cut the strip of silver sheet I fused the two ends together to make a complete ring. A little gentle teasing with a ring mandrel and it was a perfect fit on the bead. It just needs the PMC treatment now – which I hope to be able to do tomorrow – and I might even get as far as finally creating a piece of jewellery out of it!